For the past four months, The Rhode Yacht has made its way across New England experiencing all the region has to offer. We cheered on the sailors at the 2014 Vineyard Cup and the Newport Bermuda Race, devoured lobster rolls and visited The Real Yacht at the Newport International Boat Show and relaxed to the gentle sounds of folk music at the Newport Folk Festival. As the saying goes, “all good things must come to an end,” but not without first enjoying the final stop on The Rhode Yacht’s tour – the United States Sailboat Show in Annapolis, Maryland. 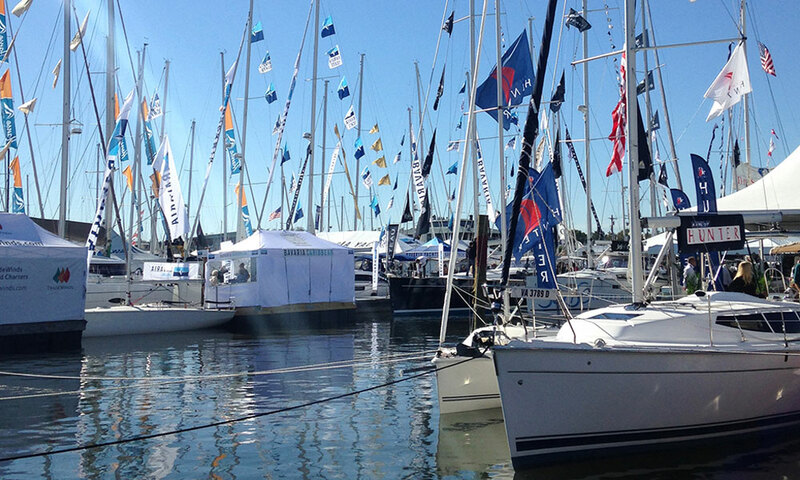 The annual event, now in its 45th year, brings together sailing enthusiasts and industry leaders from near and far to experience one of the largest in-water sailboat shows in the world. For five glorious days, visitors toured sailboats like The Real Yacht, an M36 luxury day sailing yacht by Morris Yachts built in honor of the 10-year anniversary of the M36 model. Designed to appeal to new generation of sailing enthusiasts who crave the comforts of home on the water, the M36 features a modern marine color palette anchored by high-end luxury fabrics by Richard Frinier for Sunbrella in shades of gray, white and navy blue. Custom pillows feature new Sunbrella embroidery in coordinating navy, green and white designs, while the dodger pairs Crest Ash – a new Sunbrella marine fabric featuring a flecked pattern on a gray background – with classic navy blue edging. As the fall day fades into night and the chilly evening air brings a touch of color to your cheeks, it’s time to relax and enjoy the many charms of “America’s Sailing Capitol.” In Annapolis and the Chesapeake Bay area, you can get your fill of crab cakes and maritime history to last you until next year’s show. Top off the day with a classically simple sailor’s cocktail, the Dark ‘n’ Stormy, and make a wish for clear and calm sailing for the year ahead. The Rhode Yacht and its tour across New England is part of Perspective New England, an interior design journey exploring the versatility of Sunbrella fabrics for every aspect of your life—at home, on the water or on an adventure. Be sure to watch The Rhode Yacht, The Real Yacht and The Beach House come to life with Sunbrella fabrics. Follow the entire project on Twitter and Instagram @Sunbrella and #PerspectiveNE.